JTEC is now offering Wing Incidence Adjusters for giant scale aircraft. The JTEC Incidence adjusters replace the typical plywood donut found in most aircraft and act as your wing mounting system. The Wing incidence Adjusters allow a pilot to fine tune or correct the flight characteristics of their aircraft like never before by adjusting there incidence approximately + or - 1 degree while in the aircraft. 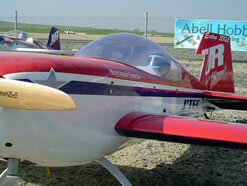 The Wing Adjuster kit can be adapted to nearly every ARF or Kit on the market. Each Wing Incidence Ajuster kit included (4) plywood ajusters, (4) 2 1/2" Wing studs, and (4) Wing knobs.